We often talk about from eras gone by or far-flung destinations, but one very powerful ingredient has been hiding in your garden or supermarket aisle all along: . These plants may be small, but they're mighty in flavor and pack a nutritional punch. Just take basil. A few leaves can transform a fairly ordinary pasta sauce into an Italian masterpiece—well, at the very least a palatable version for your Friday night spaghetti. It's for this reason that Lily Diamond of wellness blog dedicated to them. This stunning visual guide charts the flavor profiles, healing properties, and ideal flavor pairings of herbs and flowers, with delicious recipes to get cooking with them too. While the food recipes are delicious, it's the homemade face masks that made us fall in love with it. "I draw no distinction between using aromatics in or on the body," she told MyDomaine. "What we use on our skin should be as pure as what we eat. This approach makes caring for the skin as easy as a refrigerator or pantry perusal." Diamond's cucumber rose-petal mask soothes dull skin while the coconut rosemary scalp rub invigorates hair growth. "This kind of biodynamic approach to food and bodycare radically reduces beauty costs and ensures your skin is deeply truly healthy and radiant—the way nature intended," she adds. Ahead, Diamond shares a few tips on using herbs in the kitchen, along with three of her favorite recipes from the book. We're making that blackberry basil face mask tonight! MYDOMAINE: Why are herbs so crucial to every meal? 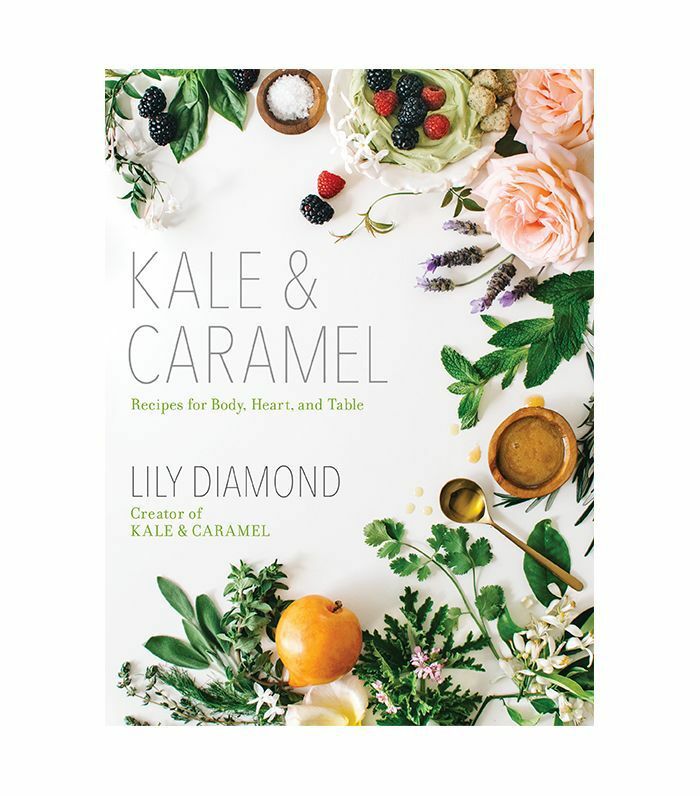 LILY DIAMOND: Aromatic herbs and flowers (in the culinary world, we call them aromatics) carry with them the living memory of experiences we’ve had in their presence. For example, basil pesto might elicit the first kiss, a rosy chocolate mousse may remind us of a particularly hot summer evening, a lavender lemonade reminds me of my mother, the aromatherapist. In this way, herbs not only transform the way food tastes but also nourish and heal, helping us relive joys and reclaim more tender, difficult moments. Each chapter in focuses on an aromatic with a distinct healing property: basil to soothe and inspire joy, mint to invigorate and awaken, rose to comfort the heart, and many more. These aromatherapeutic and cellular responses are based on centuries of studying the ways we humans react to the sense properties of each plant. At the same time, herbs offer an easy way to up the green quotient of any meal, providing bursts of healthy chlorophyll and heady flavor to breakfast egg dishes, lunchtime salads (carrot, feta, and pistachio salad with orange blossom toss), dinner entrées (roasted fig pizza with rosemary chèvre), and fruity desserts (coconut Ginger tapioca pudding with cilantro-scented mango). MD: What are some of the key ways we can add them into our diet? LD: There really isn't anywhere herbs don't belong. In , I feature herbs infused in salt and honey, sauces, dressings, soups, salads, entrées, cookies, cakes, ice creams, and juices. I love keeping bunches of herbs on hand to throw into any and everything I can—fistfuls of mint will elevate a salad, a bunch of basil can be blitzed into a quick vegan pesto and then turned into a variety of sauces and dressings, a handful of cilantro can turn a blended juice into a nourishing system cleanser. Push yourself to add herbs to dishes where you wouldn't expect them—let yourself be free to experiment with flavor and surprise yourself with the outcome. Most importantly, get to know the herb: Touch it, rub the leaf between your fingers, feel its texture, and smell its fragrance. What does it make you feel? What does it make you want to create in the kitchen? Start from a place of sensory inspiration and let yourself create from there. MD: Most people think of herbs as savory, but how can you use them for dessert, too? LD: A dessert with a savory edge is my favorite kind—it lends a complexity and element of surprise to what's usually a quite straightforward sweetness. For the book, I decided to create a frozen treat for each chapter, most of which involve an infusion of some type: Lemon thyme gets infused into honey for a lemon and vanilla bean sorbet; basil steeps into cream for a strawberry basil cream pie; sage is whisked into salted caramel for ice cream. Fresh herbs also heighten any fruit treats—I'm particularly partial to the magic of mint leaves, honey, olive oil, and sea salt on fresh fruit. MD: Can you outline your top five herbs, what they do, what their nutritional properties are, and how you use them? LD: Mint, basil, cilantro, rose, and orange blossom. These are the five aromatics I keep on hand almost always. Mint, basil, and cilantro are best in their fresh leaf form. Rose and orange blossom I keep on hand as dried edible rose petals, rose water, and orange blossom water. Mint: Invigorates, eases nausea, and supports digestion. Basil: Elevates mood, supports digestion, and reduces skin inflammation. Cilantro: Supports digestion and may help the body eliminate heavy metals. Rose: Heals the heart and induces compassion. Orange blossom: Relieves anxiety and acts as an aphrodisiac. Mint, basil, and cilantro are excellent in salads, sauces, juices, smoothies, frozen treats, and with fresh fruit. They can also be used in food-based body scrubs (coconut mint salt scrub) and honey-based face cleansers and masks (blackberry basil healing mask, which helps reduce skin inflammation). I love to add rose water and orange blossom water to treats like pie (peach and pistachio galettes with rose whipped cream), yogurt, and nut milk (orange blossom pistachio milk), but they can be equally amazing in savory dishes, like salads and roasted vegetables (cumin and rose roasted cauliflower with vinegar-soaked currants). Rose and orange blossom are particularly lovely in DIY body and beauty products, where scent can be paired with actual fruit (citrus blossom sugar brightening scrub). "Though I love the flavor of raw honey, I'm far more enamored with its power to soothe and rejuvenate even the most tired and dull skin—and thus begins my official campaign for honey as skincare president. I've received countless emails from friends and grateful Kale & Caramel readers whose skin completely transformed after they started using honey as face wash. This healing mask takes the soothing quotient to the next level with freshly crushed basil leaves and juicy blackberries. "Basil, in its many forms, has long been revered for its healing properties in India, where it's known to soothe everything from digestion to inflammation. This mask applies fresh basil leaves directly to the skin, allowing the herb to work its magic alongside the antibacterial, anti-aging powers of raw honey. Blackberries join the party to tone the skin with gentle fruit acids and vitamin C.
"Together, these three ingredients form the foundation of a skin treatment that proves you need look no further than your fridge to get your glow on." In a small bowl, crush the blackberries and strain out the juice into a second bowl. Add the honey and basil to the blackberry juice and stir to combine, using pressure to crush the basil into the honey. When fully incorporated, spread 1 1/2 teaspoons onto clean skin and let sit for 5 to 10 minutes. Then wash off completely and follow with toning spritz and Jasmine Facial Oil. Store the remainder in an airtight container in the fridge for up to 1 week. "I have never been very wild, at least not in the Cabo San Lucas–spring breakers sense of the word. My brand of wildness tends to manifest in quiet river skinny-dipping, or playing fast and loose in the kitchen, or not wearing pants all day, or singing to Beyoncé at the top of my lungs. "And yet, there is one touch of wild that's been with me from the time I first began drinking alcohol: I love tequila. The tequila that haunts so many is not my tequila; my tequila is a gentle beauty, full of laughter and sweetness and nary a hangover. I don't know how I got so lucky (per- haps it's just that I'm a true lightweight and drink only a touch at a time), but tequila has always been a friend to me. And to this Kale & Caramel riff on a traditional paloma cocktail. "While this tonic is absolute perfection sans tequila, I can joyfully recommend it with the liquor as well. And when you do choose to transition your tonic from morning sunshine to evening olé, know that I’m out here raising a glass to your (tender, intelligent) wildness." Add the grapefruit, lime, and lemon juices and a few pinches of salt. Shake vigorously, then strain out over ice. Make it a cocktail with tequila, mezcal, gin, or vodka. "We set a date. I had everything I needed, and would go to my favorite local bakery for pre-made dough. I picked rosemary on my daily stroll around the neighborhood, and made sure said friends were bringing wine and chocolate. Culinary heaven ensued—well, I thought it was culinary heaven until Janson, my partner in kitchen crime, decided to drizzle truffle oil on it. And then, my friends, this pizza officially arrived. We may or may not have eaten the entire thing in one sitting. "The key is in the alchemy of balsamic caramelized onions and oven-roasted figs commingling with rosemary. It's a combination that perfectly bridges sweet and savory, a solvent for life's complexity." Start the pizza dough 3 to 4 hours ahead. In a small bowl, combine the water, yeast, and oil. In a large bowl, whisk together the flour and salt. Add the wet ingredients to the dry and knead the dough until the mixture comes together into a ball, smooth but a bit tacky to the touch. Add more flour if the dough is too wet. Transfer the dough to a floured surface and knead for 3 minutes to create a smooth ball. Cover with a dishtowel and let the dough rest for 15 minutes, then knead for another 3 minutes. Transfer the dough to a well-oiled bowl and cover with a damp dish towel. Place in a warm location or, if your kitchen is cold, inside your oven. Let rise for 3 to 4 hours. Once the dough is doubled in size, roll it into a ball. (Cut the dough in half and form into 2 balls if making 2 pizzas.) Will keep in the fridge for 2 weeks, or in the freezer for up to 3 weeks. Bring to room temperature before using. Sprinkle a large pizza stone or baking sheet with cornmeal and stretch 1 large ball or 2 smaller balls of dough by letting them hang from both hands until they reach the desired shape and evenness. The edges can be slightly thicker than the middle, and the whole thing should be quite thin, as it will rise. It's a pretty forgiving piece of dough, so don't worry too much. If making 2 pizzas, divide all the ingredients in half. У нашей фирмы интересный сайт , он описывает в статьях про сошки для винтовки.